In 2014, the armed offensive of the Islamic State (IS, also known as ISIL, ISIS, or Daesh) in northern and western Iraq and northeastern Syria raised significant concerns for the United States. After first ordering multiple deployments of U.S. troops to Iraq to provide security to diplomatic personnel and facilities, advise Iraqi security forces, and conduct intelligence gathering and reconnaissance, President Obama began ordering U.S. military airstrikes on IS forces in Iraq in August 2014. Later in September, after laying out plans for expanded use of military force against the Islamic State in a televised speech to the American people, the President ordered U.S. military airstrikes in Syria against both IS forces and forces of the “Khorasan Group,” identified by the President as part of Al Qaeda. The intensified U.S. military engagement has raised numerous questions in Congress and beyond about the President’s authority to use military force against the Islamic State. 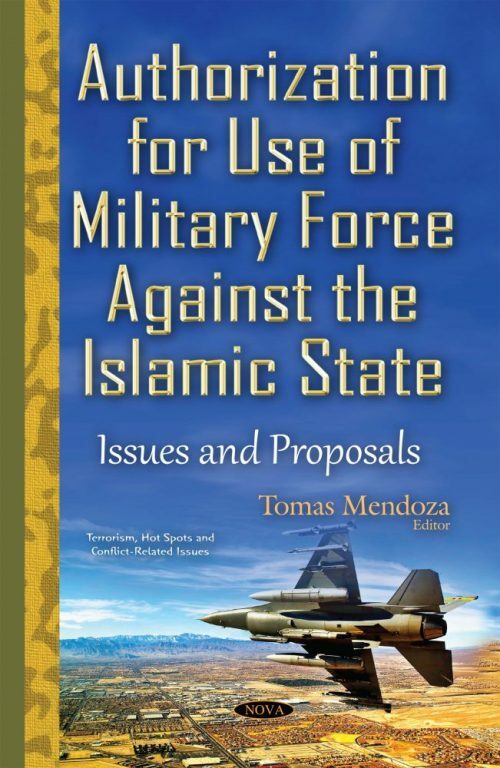 This book discusses the issues and current proposals for the use of military force against the Islamic State.